Check in opens at 9 am, and the Program starts at 9:30 am sharp. To respect the schedules of candidates in attendance, we will adhere strictly to our agenda. Review the day's Full Agenda. We will be on the second floor, with greeters to help you find your way. Arrive early! Traffic in downtown Austin can be unpredictable, so give yourself plenty of time to get to the Radisson (111 Cesar Chavez at Congress Ave.). The hotel has no vacancies on the 24th, and the parking garage may fill quickly. On site parking will be available in the Radisson garage off of Cesar Chavez. Please note that there will be accessible parking spots in the garage and that it has a clearance of 6'7". Limited street or meter parking will also be available on Brazos St. (east side of the hotel) on a first come first serve basis. Parking is free (for hotel garage ONLY)! When you enter the garage, you will receive a parking stub. Simply drop off your parking stub when you check in at the registration table on the second floor. On your way out, stop by the registration table to pick up a validated stub. Boxed lunches provided! Vegetarian, vegan, and gluten free options will be available for attendees who indicated a dietary preference. Not sure if you indicated your preference when you registered? Contact Laura Perna at (512) 478-3366 ext. 305. Lunch will be served at 1 pm. Be respectful! You may not agree with everything the candidates say or have said before, but please refrain from shouting and heckling during the Forum. Note that signs will not be permitted inside the Forum. Additionally, in the interest of nonpartisanship, you may not distribute campaign material for any candidate at the Forum. Want to do more for this historic effort? Here's how! Join the Disability Action Voting Project (DVAP). Currently working on the REV UP campaign, DVAP wants YOU to help increase the political power of Texans with disabilities and our allies. Help establish the disability community as an educated, strong, and mobilized voting constituency! Bring a friend! Whether you're coming to the Forum on your own or with an organization, we challenge you to find one more person to register. Share details about the Forum on Facebook, Twitter, email, or even in person. Encourage all invited candidates to attend! We're continuing to work with the Abbott, Patrick, and Paxton campaigns, but we haven't received their confirmations yet. Help us amplify our voice by sending them a Tweet. Need some help getting started? Use our sample Tweets! Please note that if you registered guests for the Forum, they will NOT receive this email, but feel free to forward it along. 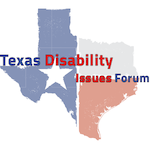 American Council of the Blind of Texas (ACBT) is a Co-Host of the 2014 Texas Disabilities Issues Forum (TDIF). Preparations are coming along for the first ever Disabilities Issues event of this magnitude. Republican and Democratic Candidates for Governor, Lieutenant Governor and Attorney General have been invited to participate in the Forum. It all takes place on Wednesday September 24th from 9:00am-4:00pm at the Radisson Hotel, located at 111 East Cesar Chavez Street in Austin. This is a historic event! Yes, historic! Never before has the disability community held a Forum with leading candidates. And please note that if you're not located in Austin, you can still participate; financial assistance to travel into town is available. Email Chase Bearden or call 512-478-3366 ext. 303 for details. Many co-host organizations ask, "What can we do to support the Forum?" If you can come, do so! Whether you come or not, you can raise your voice--The Disability Vote Does Count! What is the Wisconsin National Agenda? Resources for the Expanded Core Curriculum (RECC). The Vision Services Severity Rating Scale (VSSRS) has been developed to assist the teacher of the visually impaired in making recommendations for services to the visually impaired population in the state of Michigan. A VSRS should be completed before every Individualized Educational Planning Committee meeting (IEPC). In addition, it is recommended that the Vision Severity Rating Scale be up-dated at the end of each school year. Each of the eight categories listed on the Vision Severity Rating Scale Characteristic Worksheet is structured in terms of the impact on vision functioning as it relates to the student's educational program (core curriculum). When using the Vision Severity Rating Scale, criteria provided within each of the categories is not all inclusive and many criteria overlap from one severity level to the next. Additional factors may influence the selection of the severity level by the teacher of the visually impaired. Additional evaluations may be conducted to aid in the choice of severity levels. Each of the these concerns was discussed extensively. The VSRS is the result of these discussions. The purpose of this manual is to define criteria and guidelines for using the Vision Severity Rating Scale (VSRS) with students identified as visually impaired. It is primarily intended for use with students in general education settings and may be applicable for some students with additional mild impairments. Further, it is intended to assist the IEPC in the selection of a vision service delivery model for existing as well as newly identified visually impaired students. The Scale will also be used to document change from one service delivery model to another for existing visually impaired students. This scale is sequentially structured based upon a student's need for intervention by a teacher of the visually impaired, the core curriculum teacher's need for assistance, and the amount of time required for material adaptations. Each of the eight categories is structured in terms of impact of visual functioning as it relates to the student's educational program. The severity level descriptors within each category purposely overlap to some degree. To aid the teacher of the visually impaired in the selection of the level that is most characteristic of the visually impaired student, additional evaluations may be necessary. FUNCTIONAL VISION STATUS -- refers to the student's ability to independently apply visual skills to the core curriculum. LEVEL OF VISION (MEDICAL) -- refers to the student's level of vision as reported by an eye care specialist. NEAR VISION ACUITY (FUNCTIONAL) -- refers to the student's ability to use vision for near point tasks such as reading (i.e., Lighthouse Near Vision Test). READING MEDIUM -- refers to the student's primary mode of receptive learning (i.e., Braille, print, print modifications, tape, or combination). See Appendix B for resources. TANGIBLE AIDS/LOW VISION DEVICES/TECHNOLOGY -- refers to the student's need for/use of low vision devices and technology (specialized equipment) to facilitate maximum participation in the core curriculum. MATERIALS PREPARATION -- refers to the estimated time needed by the teacher of the visually impaired to modify materials necessary for the student's participation in the core curriculum. COMMUNICATION WITH PERTINENT INDIVIDUALS -- refers to the amount of time needed for communication with school personnel, parents, medical personnel, and agencies, regarding learning environment modifications necessary to ensure the visually impaired learner's maximum participation in the core curriculum. COMPENSATORY SKILLS -- refers to life role orientation which emphasize disability related needs, including vocational, social, and personal management skills. When determining a student with a visual impairment's ability to independently apply visual skills to the core curriculum, results of the following assessments may be considered by the teacher of the visually impaired. Distance Acuity- The following are suggested distance charts at 10 or 20 feet. Indicate the type of lighting present in the school environment. Lighthouse Flash Cards - Identification of three pictures used for younger students. HOTV - Identification of four items used for younger students. SOSH (Students of Optometry Serving Haiti) - This is a number chart and can be used for students able to recognize numbers. Lighthouse Distant Acuity Card or Sloan - letter charts to be used to identify letters of the alphabet. Feinbloom Low Vision Chart - a number chart that can measure up to 20/700. Near Point Acuity- Use of one of the following charts is recommended to screen near point acuity from a distance of 14-16 inches. Fixation - The ability to look at or maintain gaze on the object or person. At first the child may fix for one or two seconds (a duration of 10-15 seconds is preferable). Shifting of Gaze - Shifting of visual attention from object (or person) to object (or person). Convergence - Eyes turn in simultaneously to focus on the approaching object. Scanning - A student's ability to coordinate head and eyes to systematically search for stationary objects in the environment. Tracking - The student visually follows a slowly moving target crossing midline, in a vertical, diagonal, horizontal, and circular pattern. Observe the student's eyes to determine if smooth eye movement is present. Saccadic Movement - Successive, sequential eye movements characterized by eye jumps--ability to shift gaze from one point to another as in reading a line of print and shifting from one line to another. MONITORING -- The student is seen by a teacher of the visually impaired 1-5 times per school year. An annual functional vision evaluation may be conducted by the teacher of the visually impaired. Contact with the student, and pertinent individuals is intermittent throughout the remainder of the school year. CONSULTATION -- The student receives services from the teacher of the visually impaired on a monthly basis and/or regularly scheduled times throughout the school year. The services can be direct, as with a vision evaluation, or indirect, such as consultations with pertinent individuals in which specific recommendations to appropriately modify the student's learning environments are suggested. SUPPORTIVE -- The student is seen directly by the teacher of the visually impaired 1-2 times/week or 30-100 minutes per week. Functional vision evaluation is on-going throughout the school year. A minimal amount of preparation of materials or adapted aids might be needed. In addition, the teacher of the visually impaired may provide direct support to pertinent individuals, and make recommendations for changes in the student's learning environment. INTEGRATED -- The student in this model requires direct service from the teacher of the visually impaired 3-5 times/week or 60-300 minutes per week. Preparation of materials (print modification, etc.) needs become frequent. The student might need to be introduced to some new tangible aids or new skills, i.e., multiplying on the abacus, keyboarding, or life skills. The teacher of the visually impaired provides regular communication to pertinent individuals regarding the student's needs. INTENSIVE -- The student in this model is most likely to be one whose learning needs require intensive instruction 5 or more times/week or 180-360 minutes per week by the teacher of the visually impaired in order to facilitate academic growth and participation in the regular classroom. The student may be learning to use tangible aids and technology to facilitate communication in school work. Modifications in a student's learning environment (including frequent material preparation) and instruction in disability specific skills is on-going throughout the school year. The teacher of the visually impaired also has the responsibility of communicating regularly a student's visual strengths and weaknesses to all pertinent individuals. COMPREHENSIVE -- the student in this model is one who needs almost total intervention (5+ times or 240-600 minutes per week) by the teacher of the visually impaired in the adaptations/preparation of materials. Many of the students in this model are learning/utilizing high technology. Consultation with school personnel may occur on a daily basis to facilitate maximum participation in the core curriculum. Ongoing communication with other pertinent individuals is necessary. On occasion the professional judgment of the teacher of the visually impaired can influence the selection of a service delivery model that has been determined by the Severity Rating. A choice of one or more of the Professional Judgment Factors on the Vision Severity Summary may be used to place a student at a higher or lower level Model of Service Delivery than indicated by the Severity Rating alone. The use of the Professional Judgment Factors may be necessary when it appears that the Model of Service Delivery indicated by the Severity Rating does not reflect the true needs of the visually impaired student. Based upon the professional judgment of the teacher of the visually impaired, all factors which influence a modification of the Model of Service Delivery should be marked. Remember, each of these factors may be either positive or negative and should be marked if modifying a service delivery rating. This chart may be used three times. 1. Category names are listed vertically along the left hand side of the Vision Severity Characteristics Worksheet. Refer to definitions on preceding page as necessary. 2. Descriptors are listed horizontally for each category. The descriptors are listed sequentially in terms of severity, from mild to profound. 3. The numbers attached to each severity are considered part of a continuum. The specific number under each severity name is the numerical rating to be given for that severity. For example, under MILD, a numerical rating of 0, 1, or 2 is possible; while under PROFOUND, a numerical rating of 11 or 12 is possible. 4. For each category, mark the descriptor that best describes the visually impaired student. Place the appropriate severity number in the right hand column (Severity Score Column). Three columns are provided for evaluation on three separate occasions. 5. Total the right hand column to get a TOTAL SEVERITY SCORE. Total minutes of service per week. Record these findings in the Recommendations of Services section on the Vision Severity Summary. These notations serve as an indication of the approximate relationship between recordings of distant and near vision and point type sizes. Note A.M.A., Jaeger, and Metric are Near Vision measurements. COMMUNICATION WITH PERTINENT INDIVIDUALS-- refers to the amount of time needed for communication with school personnel, parents, medical personnel, and agencies, regarding learning environment modifications necessary to ensure the visually impaired learner's maximum participation in the core curriculum. COMPENSATORY SKILLS-- refers to life role orientation which emphasize disability related needs, including vocational, social, and personal management skills.